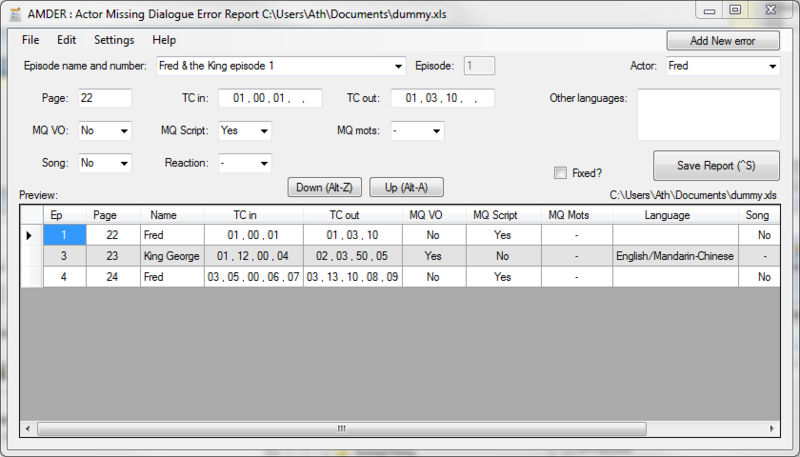 June 12, 2012 by ath 0 comments on "Amder"
AMDER: Actor Missing Dialogue Error Report, is a tool to register the Episode, Actor, TimeCodes, and some states for actors missing a dialogue to express for a play/tv-show. The Error Report can then be saved into an .xls or .xlsx file, sorted by Episode number, for feedback to the script supplier. Allows to load from a previously saved Error Report, or a specifically formed .csv file, containing "missing dialogue" for text, and optionally parsing page numbers marked as 'pgno ' from that same text. Setting the option in Settings, also all "(Song...)" lines can be extracted from that .csv file, with the same page number option. Several .csv files can be appended to be combined into a single Error Report, and read in one sweep if the Batch option is enabled. - Download, then unpack the zip-file in it's own directory, prerequisite: .NET 4.x runtime, all external libs required are included. - Run AMDER.exe, either directly or by a user-created shortcut. More flexible detection of pagenumbers, 'pgno' can be left out, or used in any combination, before a number, and that number is the page number detected. 2012-04-22, v0.5.0.0 First internal Release.